Keyboard” will send common items including your own call in the messages. Typing in the call of the other station will allow its use in the macros. (This is the callsign in the QSO Call text box). appear. Remember to SAVE when you are finished. FAQ stands for Frequently Asked Questions. It’s always a good idea to look through this list when a question pops up in your mind, because you may find the answer here. Please help us to make the station better by letting us know when the instruction pages are not clear, or if you find errors. If you have a question that you think should be included here, please send it to wa0tda@arrl.net. Canadian Stations – Want to try the USA remotes, eh? Sec. 97.107 Reciprocal operating authority. The Handiham Remote Base is more complicated than a typical ham radio station. 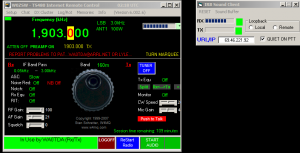 Since it is controlled via the Internet, a computer connected to the station via an interface must be listening for your commands at all times. So, beside the regular radio equipment, we have to have computer equipment, interface hardware, and a solid Internet connection at all times. In addition, the computer must be told what to do by software. Since the software is always under development, changes and upgrades will be made as necessary. Because the system is more complicated, it is also more vulnerable to things that might go wrong. For example, if the Internet connection should go down, station control will be lost. In that event, the station will timeout. We all know how computers sometimes run slowly or have something unexpectedly cause a problem after a software update. These things are bound to happen, but we hope to keep them to a minimum. Sometimes something odd or expected will happen in station control or function, and we don’t quite know how to fix it but we know under what conditions it is likely to occur and how to work around it. These are what is called “known issues”. This page was set up to provide a list of current known issues with the Handiham Remote Base. It is a good place to look if something doesn’t seem to be working right, because chances are someone else has noticed the problem and let us know about it. If there is a problem with the station that you have noticed reoccurs on occasion, please let us know about it so that we can try to re-create the conditions that caused the problem and thus diagnose it and repair it. Issues that cannot be repaired will be listed here. To let us know about an issue, please e-mail wa0tda@arrl.net. IRB Sound is one of the sound client options from the setup pull down menu. It delivers a good option to using Skype, but only with W0ZSW. The sound with this client is reported to be choppy when used instead of Skype on W0EQO. At this time we can only recommend IRB Sound with W0ZSW if you don’t want to use Skype. 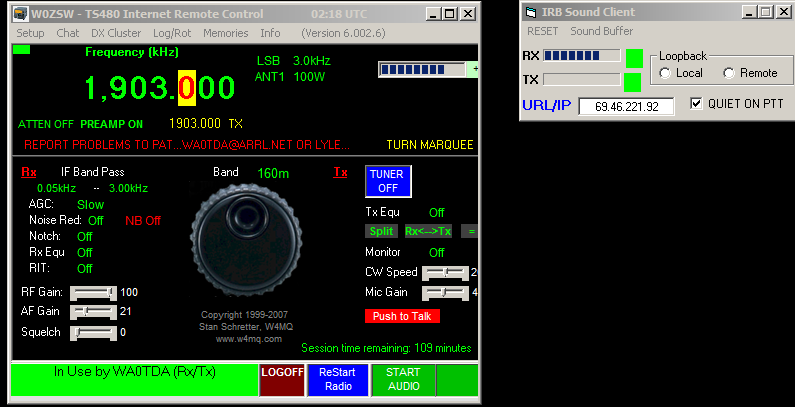 IRB Sound may be set as default in both stations, and will work great for receive. Transmit will be choppy on W0EQO, however, so if you decide to transmit on W0EQO, just close IRB Sound and call “Handiham Remote Base” on Skype. You will hear the audio from the radio and transmit will work just fine. Be sure to disconnect on BOTH Skype and the W4MQ software when finished using the station. You find the radio in split mode because someone has changed it from normal VFO mode and has not returned the radio to normal non-split operation before logging off. You make sure the W4MQ software has screen focus (in other words, it is your active Window), and you press the letter “s” to toggle the split VFO mode off. To turn split on again, press “s” again. Please leave the radio in non-split mode when you are finished using it. The list of keyboard commands is very useful. Find the keyboard commands here. W4MQ software login seems to go normally and Skype connects to the remote base automatically, but then almost immediately disconnects. We are aware of this issue but have no solution at this time. Try logging in again and chances are the station will stay connected. This generally only happens the first time you try to connect during any given session. 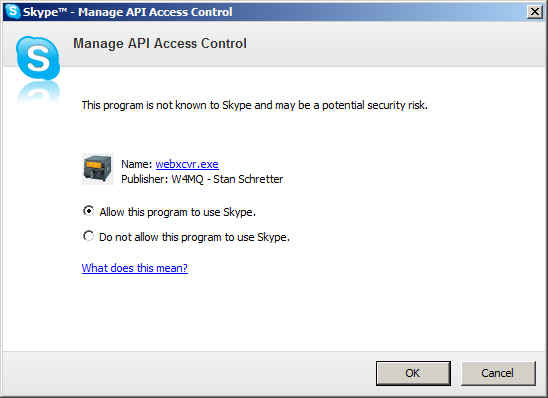 It may be a timing issue between Skype and the W4MQ software. W4MQ software crashes with a runtime error 6. This sometimes shows up with several versions of Skype. If it happens, you should choose IP Sound when you set up the sound type in the W4MQ software. Ignore the IP Sound dialog box that warns you need to forward a port. You will not actually be using IP Sound, you will still really be using Skype. Once you have made this change, Skype must be connected manually. For example, if you are going to use station W0EQO, choose “Handiham Remote Base” from your Skype contact list and connect. When you log off, Skype disconnects automatically. Occasionally the station will drop the connection right after first connecting, and you may have to login again. If this happens, login again right away and there will likely be no further problem. Skype version 5.X used with Windows 7 64 bit has been tested and works well, but occasional appearance of the runtime error is still possible. Please notify wa0tda@arrl.net if you are experiencing this problem with Windows 7. 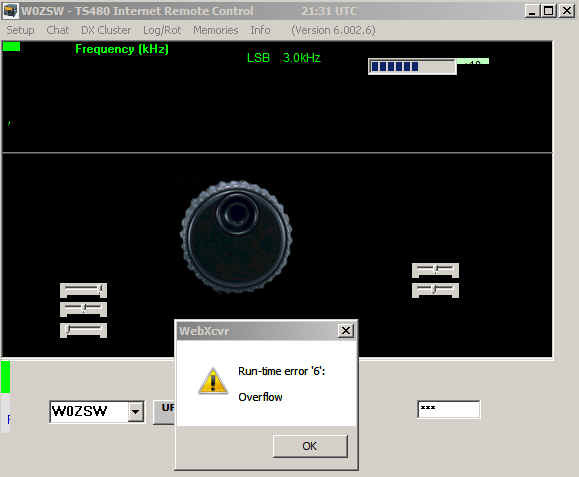 W4MQ software crashes with a runtime error 6 although it has worked all right earlier in the same computer session and you have already chosen IP Sound and followed the procedure listed above. If this happens, close the W4MQ software (Kill it with the Task Manager if it will not quit and is stuck.) Then close Skype. Skype must be completely closed, not resident in the System Tray. Re-start the W4MQ software, then restart Skype and proceed normally. EchoLink users accessing the receive function may see an incorrect frequency in the text box. For example, it may show the last frequency used, say 3.925 MHz, even though the sound from the speaker is from WWV on 5 MHz. When you change frequencies via the text box, this corrects itself. Voice frequency speech output cannot be turned off. We do not have a workaround for this in the W4MQ software. 160 and 6 m do not support transmit at W0EQO. The antenna tuner does not have a range compatible with these bands, so transmit has been disabled on 160 and 6 m until such time as changes are made in the antenna system. You may listen on both bands, but not transmit. IRB audio stutters. This is for users who are using the internal audio application in the W4MQ software only. Sometimes the audio stutters and is unusable for Windows Vista users. We suggest switching to Skype for your audio. When using the built-in logbook, keyboard command for paste CTRL-V causes the rig to transmit. Type in callsigns and QTHs, etc. instead of using copy and paste. Dialog appears saying, “This action cannot be completed because the other application is busy. 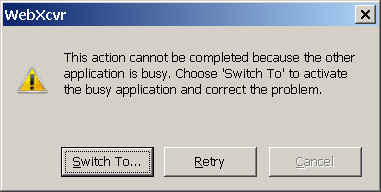 Chose ‘Switch To’ to activate the busy application and correct the problem”. When you choose “Switch To”, nothing happens. No known solution. Kill W4MQ software application with Windows Task Manager. Avoid using keyboard paste commands in logbook function. Delays and dropouts can happen because of bandwidth issues, but in some cases the apparent dropouts are caused by the fact that Skype does not provide a full duplex audio stream. Skype appears to use a form of VOX switching between transmit and receive, which can cause the receive audio to drop whenever the microphone picks up a noise. Fortunately that’s not a problem on transmit, because the audio output of the TS-480 is muted. It is possible to reduce the VOX-induced receive audio dropouts by using earphones for listening (or by reducing the speaker volume), and by going into Skype Tools, Options, Audio Settings and unchecking the box that says “Let Skype adjust my audio settings”. If that box is checked, Skype will crank up the mike gain when you’re not talking, which aggravates the receive audio cutouts and can also make the transmit audio sound like it’s going through a compressor.